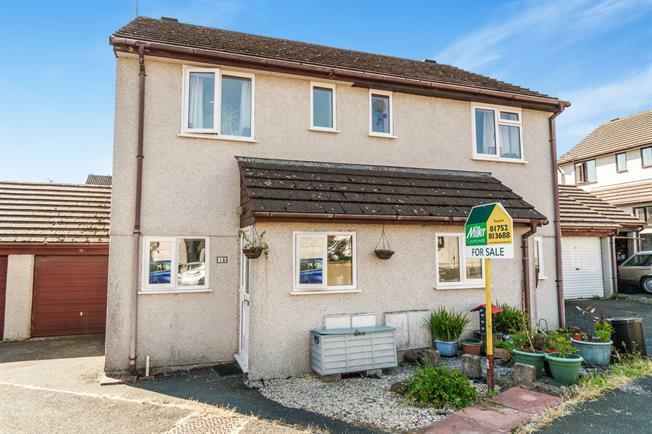 2 Bedroom Semi Detached House For Sale in Torpoint for Offers Over £130,000. Chain free well presented semi detached house set in a cul de sac location within close proximity of Thankes Park which briefly comprises two bedrooms, lounge, kitchen, conservatory and upstairs bathroom. The property benefits from a garage with power and lighting as well as storage to the loft space, parking, a courtyard garden to the rear, uPVC double glazing (newly fitted as of 2016) and gas central heating. UPVC double glazed window to front. Stairs to first floor. Door to lounge. Open doorway to kitchen. Radiator. UPVC double glazed window to front. Fitted kitchen with a range of wall, base and drawer units complemented by a roll edge worktop and tiled splash backs. Wall mounted boiler. Sink and drainer with mixer tap. Spaces for cooker with hood over, washing machine and fridge freezer. Double glazed sliding doors to conservatory. Radiator. Dual aspect conservatory with double glazed sliding door and windows to rear and obscure double glazed window to side. Radiator. Doors to bedrooms and bathroom. Loft access. UPVC double glazed window to rear. Built in wardrobe with mirrored sliding doors. Radiator. UPVC obscure double glazed window to side. Bathroom suite comprising low level flush wc, pedestal wash hand basin and panelled bath with shower over. Tiled walls. Radiator. To the front is a small garden which is laid to stone chippings. To the rear is a fenced low maintenance courtyard garden which is laid to patio paving. There is also rear access to the garage. Up and over garage door. UPVC double glazed window and door to rear courtyard garden. Storage to roof area. Lighting and power.